Current production time is 1-3 days. Interested in an out of stock listing? Just message me! Most listings can be reactivated for immediate purchase! The READY TO SHIP section of my shop has in stock items which ship same/next day. Please feel free to contact me with any questions about when your order will be shipped. Rush delivery is typically available. I never get sick of hearing great feedback like this. When the recession hit the US, the boutique I was working for closed its doors. I decided to try selling a few of my handmade sewing projects online to supplement my income while looking for a job. Before opening my etsy shop, I sold some clothes, books, and miscellaneous items on eBay and made about $200. With that money I bought fabric and supplies to make my first set of men's neckties. I had my first sale within a day and as more orders came in, it quickly became my full time career. 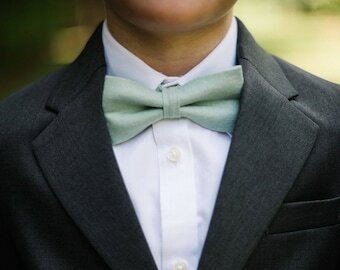 I've branched out into bow ties, kids neckties and bow ties, belts, ring bearer pillows, pocket squares, and other wedding items. It feels good to be self employed doing something that I love. It is satisfying to make things that people enjoy. I make everything myself, by hand from my studio in CT. Quality is my number one priority. I only use top-notch fabrics, thread, and hardware and stitch everything with my sewing machine or by hand. Thank you for supporting small business! Owner, Maker, Designer, Curator, Photographer, Seamstress, Customer Service, Shipping - I Do It All!